Yet another improbable comeback by the Habs, this time against Pittsburgh, can’t help but make me appreciate the remarkable legacy of “Les Habitants”. As those of you who have followed this site know, I was raised (immersed, actually) in the 1950s in a family led by men—a strong-willed father and two much older brothers—who were passionate Montreal Canadiens hockey fans. 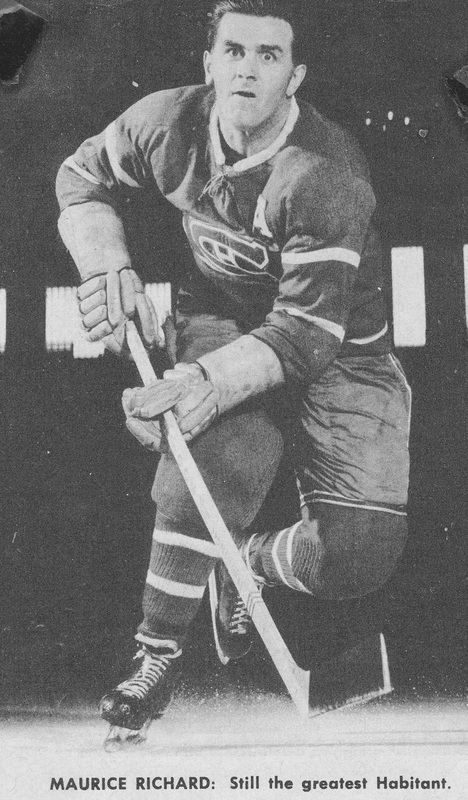 As a result, I have always loathed the Canadiens, though I have long since come to appreciate and admire what their all-time greats like Harvey, Plante, Bouchard, both Richards’, Moore, Tremblay (all of them) and Beliveau, among many others, stood for- and who they represented. Admittedly, there hasn’t been much to hate since the early ‘80s. Yes, the Habs have managed two Cups since their dynasty ended in 1979, but they have never been a dominant team, the hands-down “favorites” as they were pretty much the entire time from the early 1950s to the early ‘80s. This year’s team barely eked into the playoffs. Yet here they are, a team without superstars advancing because of Halak’s sudden heroic efforts in the first two rounds of the playoffs, a similarly remarkable performance by Cammalleri, along with gutsy efforts by their defensemen, including former Leaf Hal Gill. Another ex-Leaf, Dominic Moore, continued to make a difference at both ends of the ice last night, as he has through much of the playoffs. You don’t win a series against teams like Washington or Pittsburgh unless you have 25 guys ready to give maximum effort every night. We often focus on the superstars, like Crosby (and understandably so) going in, but end up talking about people like Moore and Travis Moen. Nonetheless my thoughts right now are more on what this means to Montreal fans. In the hockey universe, maybe only the city of Toronto can compare when it comes to fans who care deeply about their team. Anyone who has followed hockey for any length of time knows the passion that Quebeckers have for their side. In my youth, there was, as best I could understand it given my own upbringing, a cultural pride based on the French-heritage of so many of the great Canadiens dating back to the 1930s—Morenz and Joliat, etc.. Perhaps not for all, but certainly for some, religion, culture and language all played into that passionate support for Montreal’s hockey team. Times have obviously changed but whatever the root of that feeling was has always remained in some form. Still, years of not winning will muffle even the proudest fans. Now they have something to cheer about again. Maybe the ride will end in the next round. Maybe it will be like ’86 and ’93 again—an unexpected, one-off championship. But for a lot of us, this is what makes hockey so exciting—because this is a team with a history and a fan base with a sense of the history of the game. Other teams, like Tampa Bay and Carolina, have had their one moment in the sun. But in truth, while their fans ‘celebrated’ at the time, who is talking about hockey in those markets now? In Montreal, true hockey fans would still be talking about the Habs, even if they had missed the playoffs—just like Leaf fans think and talk about the Leafs twelve months of the year. (This is why, sooner or later, the NHL has to wake up and bring teams back to the markets where hockey matters to more than the 15,000—or less—people in the stands. To cities where it matters to people on the streets, places like Winnipeg and Quebec City. But for now, even for those who still “hate the Habs”, we can enjoy the fact that people who really and truly love this game in a market that matters have something to cheer about for the next two weeks—and maybe longer. You know the Rocket is pleased.